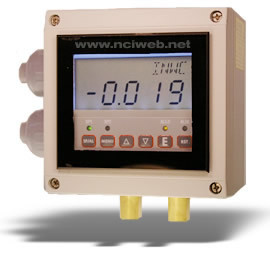 The Digihelic® Controller just got better with the New Series DHII Differential Pressure Controller. The DHII takes all the fabulous features of the standard Digihelic® Pressure Controller and packages them in a robust NEMA 4 (IP66) housing. The Digihelic® II Pressure Controller combines the 2 SPDT control relays, 4-20 mA process output and Modbus® communications with a large, brightly backlit 4 digit LCD display that can easily be seen from long distances. The electrical wiring has also been enhanced in the DHII with its detachable terminal blocks. The removable terminals allow the install to easily wire the terminal block outside the housing and then attach to the circuit board, reducing wiring difficulties and installation time on the process. The Digihelic® II Differential Pressure Control in the new NEMA 4 (IP66) enclosure enables this product to be the perfect choice when mounting pressure controls outdoors in such applications as rooftop air handlers. This housing also makes it the ideal solution for surface mounting in clean rooms or facilities where water or a cleaning solution is utilized in maintaining plant cleanliness. Pressure Limits: Ranges 5": 5 psi; 10": 5 psi; 25": 5 psi; 25": 5 psi; 50": 5 psi; 100": 9 psi. Power Requirements: High Voltage Power = 100 to 240 VAC, 50 to 400 Hz or 132 to 240 VDC. Low Voltage Power = 24 VDC ±20%. Power Consumption: Low Voltage Power = 24 VDC - 130 mA max. High Voltage Power = 100 to 240 VAC, 132 to 240 VDC - 7VA max. Response Time: 250 ms (dampening set to 1). Display: 4 digit backlit LCD 0.6" height. LED indicators for set point and alarm status. Electrical Connections: Euro type removable terminals blocks with watertight conduit fittings for 1/2" watertight conduit. Size: 4.73" x 4.73" x 3.43" (120 x 120 x 87.1 mm). Serial Communications: Modbus® RTU, RS485, 9600 Baud. Electrical Rating: 8 Amps at 240 VAC resistive. 351-9 - Mother Node™ silver RS-232 to RS-485 Converter with DB9F Connector, includes 120 VAC to 12 VDC Adapter. Digihelic® Links - Communications Software. *Velocity and volumetric flow not available on bi-directional range units and models DHII-009 & DHII-010.